The “Project of Heart” is an in inquiry based, hands-on, collaborative artistic journey of seeking the truth about the history of Aboriginal people in Canada. The purpose is to: examine the history and legacy of residential schools in Canada, acknowledging the loss of former students, commemorate the lives of the thousands of children who dies as a result of the residential school experience, and call Canadians to action through social justice endeavours. The Project of Heart acknowledges the families and communities whom those children belonged to. 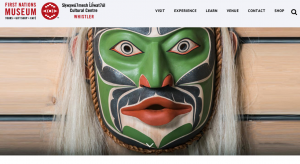 Originally, this website was designed to bring awareness, but as it has evolved, this is a tool used to educate all Canadians about the history and legacy of this crime and tragedy. This resource was created for: teachers who want to know the truth and inspire their own students to speak the truth and take a positive action in society, families who want to become more aware, and anyone who wants to know the truth behind the reality that Aboriginal people are faced with today and to work together to make a difference NOW. There are over 60,000 students in BC’s school system who self-identify as being Aboriginal (First Nations, Métis or Inuit) ancestry. Recognizing that our students are our future, Aboriginal Education seeks to: improve the success of these students, support all students learning about Aboriginal peoples, and help teachers in their efforts to bring Aboriginal knowledge into their teaching practice. I’m not sure how many of us are high-school teachers, but below are some scholarship opportunities provided to Aboriginal students. 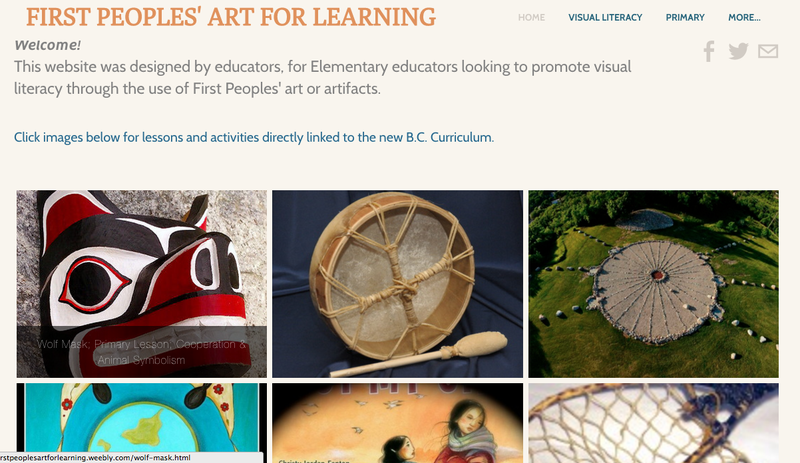 All information can be found on the British Columbia Education webpage under the Aboriginal Education tab. After doing the readings for Module 1 and learning about the importance of place, and based on the experience I have working and living in a Cree Community for a bit over three years, I am interested in the programs and opportunities that introduce, use and promote media and technology, not just in K-11 education, but in various aspects of community life. I wanted to include N’we Jinan, because they have a big presence in the community I live in. They have visited my school and created music videos with our students. The writing, production and filming processes are truly amazing! However, others have already mentioned the program, so I will leave it out. Minority Media is a company based in Montreal that creates virtual reality games. They have focused on introducing a new type of video game genre: empathy games. In 2014, they released Spirits of Spring, a game that centers on a young boy, Chiwatin, and his friends in Northern Canada who are trying to come to terms with bullying. Minority Media also created a virtual reality game for the Cree School Board to help young students learn Cree Syllabics. With the help of a girl named Niipiish and her dog, students learn new words in a really exciting way. I’ve played this game and watched my students use it. It is a very interesting way for them to practice their language. Mikw Chiyâm is an arts program with the goal of increasing student retention and engagement. Professional Canadian Indigenous and non-Indigenous artists are in residency at an appointed CSB school for a 7 week program. 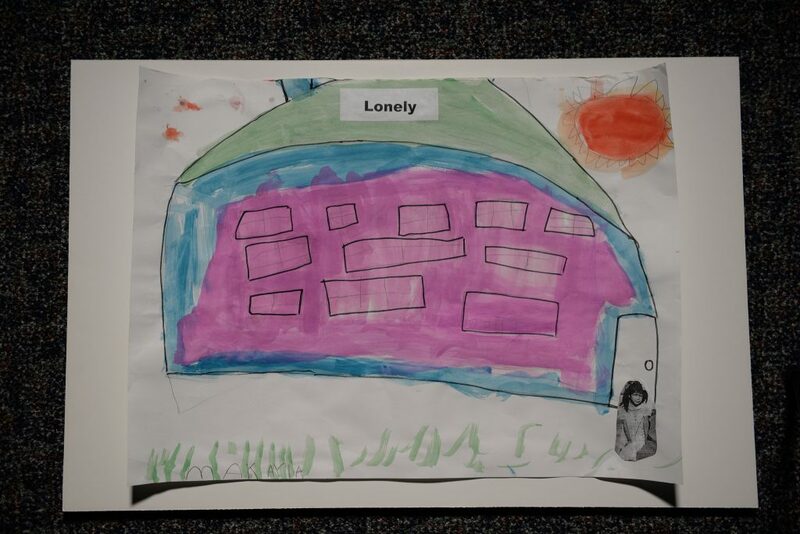 There are four residency cycles per school year, which allows the students to be exposed to a variety of artistic forms. They collaborate with local artists and students to help them express their voices creatively. While this program is not explicitly about technology, certain of the artists-in-residence have this as their specialty and incorporate it into the program in various ways. The Cree Cultural Institute is a museum with information and artefacts aimed at preserving and passing on Cree traditions, knowledge and values. Almost everything is accessible through the website. Visitors can virtually explore categories such as hide and fur preparation, moccasins and mittens, and snowshoes and toboggans. There are descriptions, images and even videos. There are also different zones, such as The Community’s Way of Life and The Land Has Memory. The museum even has an app! The Nation is an independent Aboriginal news publication that covers and reports on stories about and impacting residents of the James Bay area in northern Quebec and Ontario. In addition to news and events, The Nation website also has an extensive list of Cree Legends, available in both English and Cree. Eeyou Istchee James Bay Regional Government website provides a wide range of information about this region, such as a brief history, the territory and their services. The publish reports on important issues such as drinking water, as well as news. The website also live streams events, such as elections and council meetings. We are currently participating in a school-wide inquiry at my school to increase First Nations cultural awareness through First Nations art, music and performing arts. I am providing you with some website links that have helped us along the enriching process. The following website was a group project created in ETEC 511. Our goal was to create a cross curricular resource for teachers that linked Canadian First Nations art and artefacts to the curriculum via a visual literacy framework. Our goal is to continuously add to this resource, with the intention to add oral stories and personal accounts from elders. Please share, make comments or ask questions about this resource. 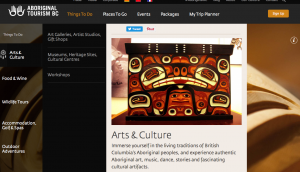 This website was created by the Aboriginal Tourism BC (AtBC) foundation who have established the Authentic Indigenous Arts Resurgence Campaign (The “ARC”). 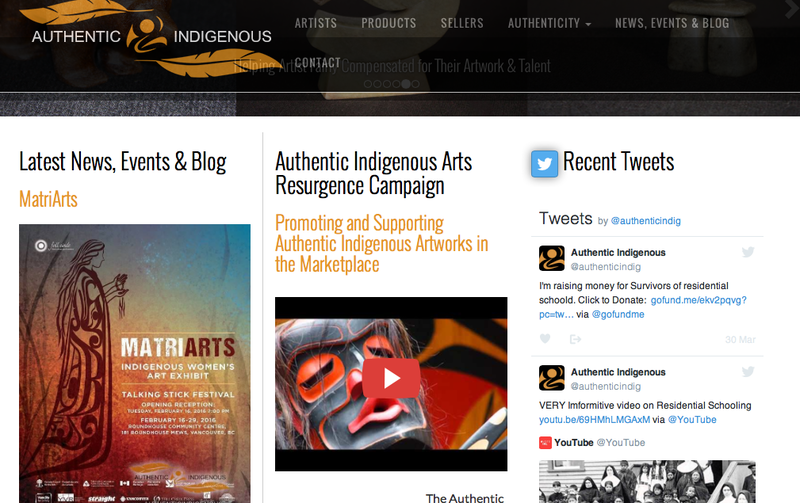 This website provides a comprehensive list of First Nations Artists in Canada where they are listed by first name in alphabetical order. Each artist has their own page where viewers can read a short bio, view examples of their work, and search any links that may take them to projects or personal websites. It also posts events, campaigns, and articles, and members can connect with each other through the blog, and social media. This informational website provides a database of Canadian artists, including First Nations, located across Canada. Anyone can search for artists by name, location, subject/category, and advanced search options which include curriculum. 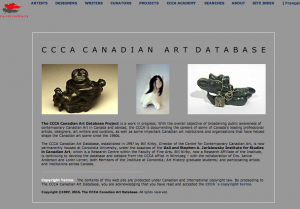 It is a place where Artists have the showcase their work, mention projects they are working on, and list events that are happening across Canada to promote their Art. The Squamish Lil’wat Cultural Centre was founded to showcase the art, history and culture of the Sk̲wx̲wú7mesh (people of the Squamish villages) and the L̓il̓wat7úl (the people of the land) nations. Visitors on the website can learn about the Nations’ past and present history, shop online for authentic artisan merchandise, as well as book tours. During the visits, visitors are taken through a guided tour of the centre, and they also have the opportunity to sign up for interactive workshops which could involve an interpretive forest walk, holistic tour and indigenous tea ceremony, or participation in various indigenous crafting workshops. The page dedicated to Arts and Culture, on the Aboriginal Tourism BC website, takes the visitor on an exploration of the many art galleries, studios, museums, cultural sites and cultural centres that are located throughout BC. Visitors to the website are also able to book special visits and tours. A strong polemic by John Goldi on the hoax that many of Morrisseau’s paintings are forgeries. The site details through documents, videos, timelines a complex story of the attempt of art dealers to raise the value of some of Morrisseau work by calling into question the authenticity of many of his later work.